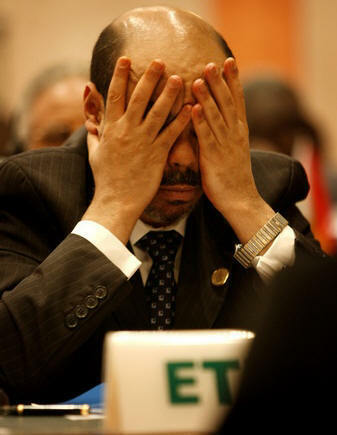 HE HAS run Ethiopia as prime minister since 1991, but Meles Zenawi, still only 54, has two faces. One belongs to a leader battling poverty. In this mode he is praised by Western governments, with Britain to the fore, for improving the miserable conditions in the countryside, where 85% of Ethiopia’s 80m-plus people live. Mr Meles takes credit for building new roads, clinics and primary schools, and for an array of agricultural initiatives. He also wins plaudits for his country’s low crime rate and for keeping its parliamentarians more or less on the straight and narrow, especially in terms of wealth. They get paid only about $3,240 a year compared with the $120,000 earned by Kenya’s fat-cat MPs. Moreover, in the past few years Ethiopia’s economy has grown fast. Mr Meles says it will grow this year by 10%, though the IMF’s figure is about half as big. His mind is sharp, his memory elephantine, and he bristles with energy and vigour. In a rare interview, he speaks for two hours without notes. With his polished English, full of arcane turns of phrase from his days at a private English school in Addis Ababa, the capital, he captivates foreign donors. Though he avoids mentioning famine because the spectre of it may be looming again, he uses the memory of past debacles to prick Western consciences. Last month he suggested that the famine of 1984, which stirred Band Aid to come to Ethiopia’s help, may have been worsened by the pollution in Europe. He says he fully expects the West to pay $40 billion a year to Africa to compensate it for the damage caused by climate change. But then there is the harsher side of Mr Meles, the Marxist fighter turned political strongman with a dismal human-rights record who is intolerant of dissent. In 2005, after a disputed general election, his police shot dead some 200 civilians. An independent inquiry ended up with several of its judges fleeing the country. Mr Meles sprinkles spies through the universities to intimidate and control the students; he was once a student agitator himself. He closes down independent newspapers and meddles in aid projects, banning agencies that annoy him. Last month he suspended the activities of about 40 of them from the Somali-populated parts of the country. Many of Ethiopia’s opposition leaders were imprisoned after the election of 2005 on trumped-up treason charges; after a year or more, they were freed. But several have been rearrested. A new catch-all law that has just been passed could make peaceful opposition liable to the charge of inciting terrorism. In any case, the economic story is not quite as rosy as Mr Meles suggests. Ethiopia may have only a few weeks of foreign reserves left. On the business front, the country remains very backward. Ethiopians have one of the lowest rates of mobile-phone ownership in Africa. Banking is rudimentary at best. Farming is still mostly for subsistence. And famine looms once more. At that suggestion, Mr Meles narrows his eyes and growls, “That is a lie, an absolute lie.” There is more than enough food in government warehouses to feed the people, he says. But others say stockpiled grain has already been earmarked for handing out to people in the towns. The UN and foreign charities are predicting a large-scale famine in Tigray, Mr Meles’s home region, by November. At least 6m people may need food handouts unless more supplies can be found locally. Mr Meles’s officials, most of them still working in gloomy Soviet-built offices, often sound almost paranoid in their sensitivity to criticism. The prime minister is quick to talk up threats to his country, whether from malcontents in the army or disgruntled ethnic groups among Ethiopia’s mosaic of peoples. Radical Oromos, a southern group that makes up about a third of Ethiopia’s people, often fall under suspicion. A bunch arrested earlier this year after an alleged attack on a dam under construction were paraded on state television as members of the secessionist Oromo Liberation Front (OLF). The government also regularly publicises threats by the Ogaden National Liberation Front, a Somali separatist group in the east, which has murdered foreigners and Ethiopians exploring for oil in that area. And he remains edgy about the continuing strife in Somalia. In late 2006, with American encouragement, he sent his army there to topple an Islamist government that had declared a holy war on Ethiopia. Earlier this year he withdrew his troops after it became apparent they could not impose peace. But now the jihadists are gaining ground there again, bringing in al-Qaeda types—just what Mr Meles wanted to prevent. So Mr Meles is up against it, at home and abroad, but apparently relishing the challenges. A general election is due next year. He had previously hinted he might step down after it. More recently, he has sounded less sure, dismissing such speculation as “boring”. Some say he may leave his prime ministerial post but stay on to chair his ruling Ethiopian People’s Revolutionary Democratic Front. He seems likely, in whatever guise, to call the shots—with decreasing dissent.